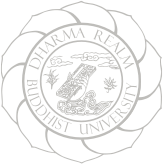 DRBU is a small private school dedicated to liberal education in the broad Buddhist tradition—a tradition characterized by knowledge in the arts and sciences, self-cultivation, and the pursuit of wisdom. Freedom is the goal of the liberal education. At DRBU, students learn directly through the great books of Western, Eastern, and Buddhist thought, bringing the texts to life in engaging, discussion-based seminars. A liberal arts education opens the mind and builds a foundation for a constantly changing life. Study the Buddhist philosophical tradition through its classical texts.